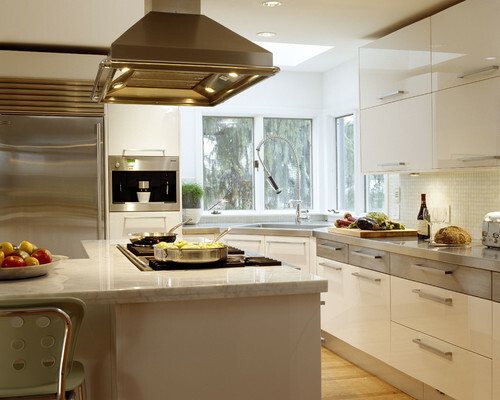 For homeowners in Manhattan, Brooklyn or Queens, your kitchen is the main focal point of your home. Most likely, this is the room that defines you more than any other room in the house. This is where you prepare meals, eat with your family, have a coffee with your neighbor, perhaps even Instagram a special meal. The look and feel of your kitchen must be both beautiful and functionable. So, using your space in an efficient way can make this high-traffic room easier to keep organized, as well as cater to your many needs. Whether a home in Manhattan, Brooklyn or Queens, there is no one cookie cutter solution. 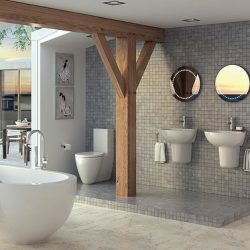 The dream is to have a generous sized kitchen, yet more common, areas with limited space presents a creative challenge, using all possible options. 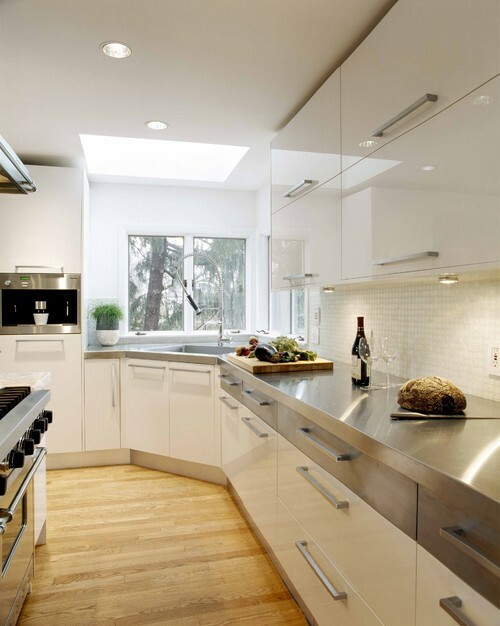 Planning effective design for your kitchen will pay off in the long run. One of the most efficient ways to use good design is to utilize your corners with corner kitchen cabinets. Choosing corner kitchen cabinets requires some consideration about your daily kitchen use. Sometimes, during the process of designing a kitchen, fitting in corner kitchen cabinets can even be both a space and a function problem. 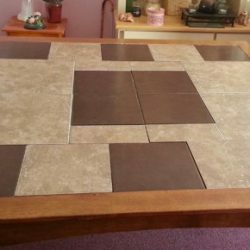 Efficiently utilizing this corner space with a cabinet can be done with a bit of research. Corner kitchen cabinets requires some consideration about your daily kitchen use. Sometimes, during the process of designing a kitchen, fitting in corner kitchen cabinets can even be both a space and a function problem. 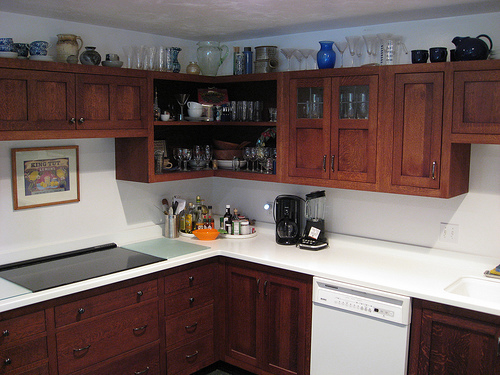 Efficiently utilizing this corner space with a cabinet can be done with a bit of research. When choosing a corner cabinet in Manhattan, Brooklyn or Queens, choosing a multipurpose cabinet must fit the available space. Diagonal corner cabinets: these cabinets are ideal for more spacious kitchens. These particular corner kitchen cabinets offer excellent management of space with functional furniture. Corner sink cabinets: these cabinets offer an opportunity to add a corner sink for chef or child hand washing, mini-bar or coffee-bar. Blind base cabinets: while offering flexible corner kitchen design, there is some unusable dead space that goes along with this cabinet choice. Open shelves: these shelves on a counter gives you more space to place a mixer or food processor. The shelves are a great place to display cookbooks or store spices and sauces. Glass door curio shelve: this is an elegant way to store those copper family heirlooms, that handmade platter or pitcher from Tuscany, your Swedish glass or odd shaped platters. Built-in appliances: utilizing a corner for your microwave or oven is a great way to utilize space. Corner pantry: whether open shelves or a closed cabinet, this is a great opportunity to store prepackaged foods, spices and condiments which is especially space efficient for cozier kitchens or kitchens without a built-in pantry. Lazy Susan: A Lazy Susan is a rotating circular storage unit. Many corner cabinet Lazy Susans have multiple shelves and use space efficiently because all stored items have easy access. Shelves: Shelves installed in corner cabinets allow easy access to the items placed in the front, but can be a bit cumbersome retrieving items in the back shelves. Drawers: Pull out drawers allow access and are ideal in storing specialty tableware, knives, linens, or other odd-shaped or hard to store utensils. You have decided on what you want your cabinet to look like and how it will function in your household. Where do you buy your cabinet? Large home improvement stores, as well as smaller design firms can either sell you or build you a unique cabinet. The key is to have the correct measurements and find a cabinet material that will either match or complimentary contrast with your current cabinets. If your budget allows it, you can custom create an entire kitchen cabinet set. When your kitchen is finished, done, will be glad you spent the time to investigate all of your options and find joy in the functional and beautiful kitchen you have created.